Dollar Creek Way Trail #114 – This description covers the first 3 miles of the trail to its intersection with the Needles Route Trail. The trail continues east about 4 miles to Forest Service (FS) road 495. The western 3 miles of this trail are open to all trail users. The eastern 4 miles are only open to non-motorized uses. This trail provides access to the Gold Fork North Trail and the Needles Route Trail. The Needles Fire burned within .25 mile north of this trail in 1989. The trail is easy to follow as it climbs gradually, then more steeply toward its destination. Approximately 0.2 miles from the trailhead, the unsigned Gold Fork North Trail drops steeply to the right. The trail crosses five creeks within the next 1.6 miles, three of which are major fords. After fording the North Fork Gold Fork River, the trail steeply switchbacks up the hillside for approximately 0.5 miles. At the top of the switchbacks, the trail again levels out and gradually climbs to its signed intersection with the Needles Route Trail. The East Mountain Way Trail offers views of Round Valley and Long Valley, passes through forests and meadows, and ends near East Mountain Lookout. For most of its length, the trail overlaps a ridge, but occasionally descends to the ridge’s west side. Recreationists should pack extra water as there is none available along the trail. Sections of Forest Service (FS) Road 417F (East Mountain Lookout Road) which accesses the north trailhead is steep and eroded. A high-clearance vehicle is recommended. The unsigned trailhead begins in a prominent saddle on FS Road 417B as a stock driveway and heads northeast. Shortly, it steeply ascends, and then descends a ridge. In a saddle where Round Valley can be seen to the west, the stock driveway narrows to a trail. When it reaches a small hill with an aspen grove, the trail will be difficult to find as it heads east across a meadow. The trail continues northeast passing through a lodgepole pine forest and by granite boulders which provide a view of Herrick Reservoir. The blazed but unsigned trail ends at its intersection with FS Road 417F. There are 3 sections of the East Mountain Way Trail. Please refer to the Motor Vehicle Use Map (MVUM) for open areas for OHV travel. (Sections include: 099B04, 099A04 and 099C04). The ford of the Gold Fork North Trail at the northern end of the trail, is deep and swift for all users. The other two fords shouldn’t be much of a problem for hikers and horses, however the last one could cause some problems for motorcycles. Also, the upper portion of the trail is very steep, and may be difficult for motorcycles. The trail travels through open forests of larch, lodgepole pine, and fir, which provide for views along the trail. The trail ends at the old Gold Fork Lookout. From the cement platform of the lookout there are panoramic views to the west, north, and south. The Spruce Fire burned through the upper part of this trail in 1989. The buildings associated with the lookout may have been destroyed. Starting at the western trailhead for Dollar Creek Ridge, hike up Dollar Creek Ridge for approximately 0.2 miles. The unsigned but very evident Gold Fork North Trail drops steeply to, and fords, the North Fork of the Gold Fork River at this point. The trail gently climbs and fords a side drainage in another 0.3 miles. The trail continues this gentle climb along a ridge through a mixed larch and lodgepole pine forest, and crosses another creek at 1.3 miles. After this last ford, the trail alternately climbs steeply and gently as it works its way up another ridge. This ridge is a mixture of open areas with lodgepole pine and fir forests. There may be evidence of wildfires within the forested areas. At 2.4 miles, the trail levels out as the ridge flattens for 0.6 miles. At 3 miles, the trail begins to climb very steeply for about 0.4 miles. The last 0.5 miles are gentle and the trail approaches the old Gold Fork Lookout from the northeast. The first thing you see of the lookout area is the green roof of the old garage. As you come around a granite outcrop, you see the garage, an old tool shed, pit toilet, and the lookout. Only the cement platform remains of the lookout. Climb the steps and in the northwest corner of the platform is a USGS survey marker. Views from the platform include Needles to the north; Long Valley, Cascade Reservoir, and West Mountain to the west; and the Big Creek drainage to the south. Far in the northwest may be the Seven Devils. Needles Route Trail – The trail follows a ridge for most of its length providing views of the surrounding area. The trail intersects the Dollar Creek Ridge Trail, 6 miles from its southern trailhead. The designated trail begins as an old road that looks passable by car, but becomes treacherous at about .25 mile and four-wheel drive is necessary to go any further. The road is quite nice for hikers, horseback riders, and OHV users as it climbs gradually for two miles. A small stream separates the road from the trail and must be crossed to continue on the route. Blazes are everywhere along the trail as it climbs more steeply over sandy granite soil and bare rocks on its way to Gold Fork Rock, .5 mile beyond the road’s end. Passing the Rock, the trail continues north past smaller rock outcrops that tower above the trees. About 3.5 miles from Gold Fork Rock the trail intersects with the Dollar Creek Ridge Trail. The intersection is marked by signs, but care must be taken to stay on the correct route. As the intersection is approached from the south, the trail branches into three: to the west and east is Dollar Creek Ridge, and the north is Needles Route. Be sure to take the middle trail that dips down a small gulley and back up again to continue on its way to the north. Nearing the north end of the trail, blazes on trees plus numerous faint trails make things confusing. Follow the most obvious and/or newest blazes tree by tree. This should lead to a small alpine pond near the base of three 8,000 ft.+ peaks, including Square Top. Basically, this is the end of Needles Route because hiking in any direction except south at this point brings the users to a ridge which is the boundary with the Payette National Forest. There are no signs marking the end of the trail. Wilson Creek Trail – The trail crosses several creeks, passes through meadows carpeted with wildflowers, and skirts the edge of Rock Lake. 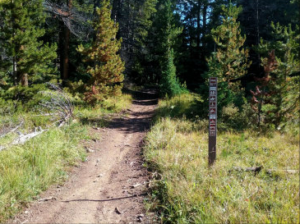 Although several trails access the Wilson Creek trail, the Burnt Wagon Basin-West Mountain jeep trail is recommended as the primary access. A 4WD high clearance vehicle is advised for this 3 mile section of road. Because sections of the trail are criscrossed by cow paths, the trail will be difficult to find. Only a few blazes and rock cairns mark the trail. The trail passes through areas grazed by cattle in the summer and fall. Within 3 miles of the trailhead on Forest Service (FS) Road 435, the jeep road diminishes and the Wilson Creek trail begins. As the trail overlaps a ridge south, it offers panoramic views of the surrounding mountains. Within a mile, the Wilson Creek trail turns east through a meadow where the trail will be difficult to find. Shortly thereafter, the trail parallels Rock Lake and crosses several unnamed creeks. The trail ascends a ridge, reaches a road closed sign and intersects the unsigned Greenfield Flat trail from the northwest. Within another mile, unsigned Campbell Creek trail and unsigned Skein Lake Trail also intersect the Wilson Creek trail. At the Skein Lake trail intersection, the Wilson Creek trail turns abruptly southwest and within a mile intersects the unsigned West Mountain trail where it ends. When you come for the trail riding we have p[laces for your trailers and room to relax. Parking. We have Parking for Big trailers!